You know those people who tell you not to visit Disneyland until kids are “old enough to remember it”? Ignore them. If you wait too long, you’ll miss the magic. I’ve taken children ages 5 months to 17 years to Disneyland over the years, with one brave day including 5 children on my own. It was chaotic, stressful at times, and worth every bit of effort. My favorite age group to take to the parks is from around 2-5 years old for a variety of reasons. Kids in this age group really believe in the magic and embrace so much of what I love about Disneyland. Here’s some tips on how to get the most out of your trip with toddlers. One of the best perks of a visit to Disneyland is that you can stay on or off-site and have a great experience. DLR Hotels give you an extra dose of magic with stellar Disney service, close proximity and privileges like package delivery to your room and extra magic hours. There are many good dining options at the DLR hotels, too. 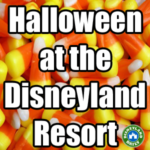 Off-Site Hotels are less expensive and are often closer to the parks than DLR Hotels. 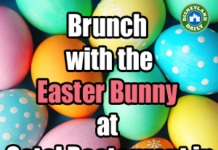 They, too, have lots of advantages including location, possible free parking and some have free breakfast, too. When to tell your toddler? Well, that depends on your toddler. If you have a little one prone to questions like “Is it today?”, “I get in my car seat now?”, “We go to see da mouse?”, I’d maybe hold off until a few days prior. If you feel like your little one can handle the news, there are plenty of ways to announce your trip that will add to the anticipation. 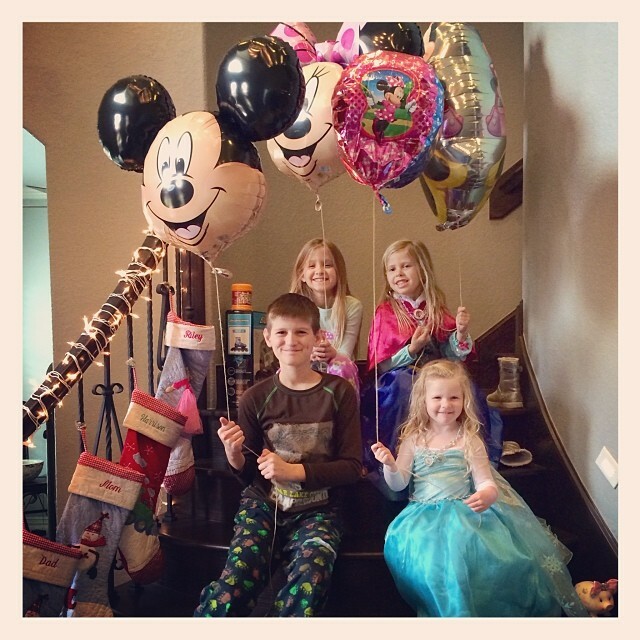 A balloon delivery, a puzzle surprise, Disney themed meals and countdown calendars are fun ways to help your children learn about the big news and even gauge the amount of days until they go. 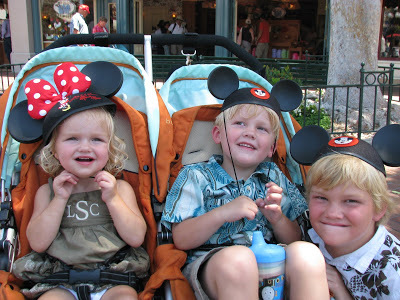 I pushed a stroller – single or double – through the park until my kids were 5+ years old. I can’t stress enough how important having a stroller is for everyone involved. Kids love to take a rest and even withdraw a bit from the busyness of the park. We used our stroller for naps, feeding, quiet time and more. They provide a great seat for parades, too! There are options for renting one if you don’t want to bring your own. Tie a balloon or ribbon onto your stroller to easily locate it within a big crowd of other strollers. They’ll start to look more and more like each other as the day progresses. Know this about DLR transportation: Children of any ages are not permitted to sit or sleep in strollers while on any form of Disney transportation – trams to the parking garage, monorail, etc. Be prepared to wake your child if you board these options. Bag #1: Pack one with valuables (camera, wallet, tickets, phone) that is easy to carry on rides. I keep these items in a backpack that I wear throughout the day. No need to fumble around for everything upon getting in line. Have it all ready to go in your backpack. Bag #2: Pack this bag with non-essentials, in case it were to get lost or stolen. For me, this bag contained sweaters, glow sticks, snacks, wipes, diapers, ponchos, blanket (for the parade) and more. Anything bulky and heavy was left at the stroller. **I’ve never had anything stolen at Disneyland, but you just never know. Bring pricey items with you. For me, that also included princess dresses and Mickey ears that I would not want to replace. In a bit, I’ll cover touring plans and within that information, you’ll find which attractions include a FASTPASS option. 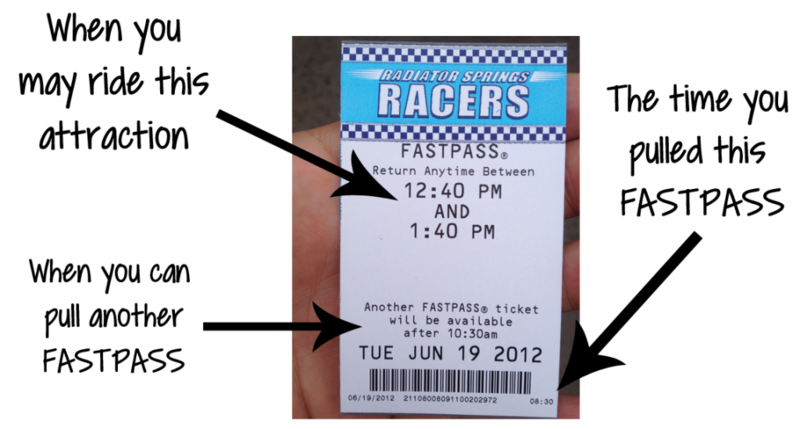 Spend a few minutes learning how FASTPASSES work at DLR. Although fewer toddler rides include them, you’ll be glad you used them for the ones that do. 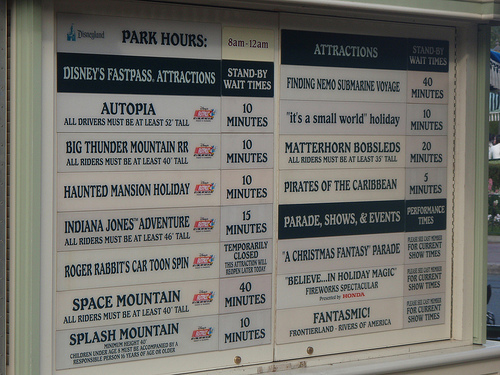 In the FASTPASS post I mentioned above, I cover Single Rider attractions, too. 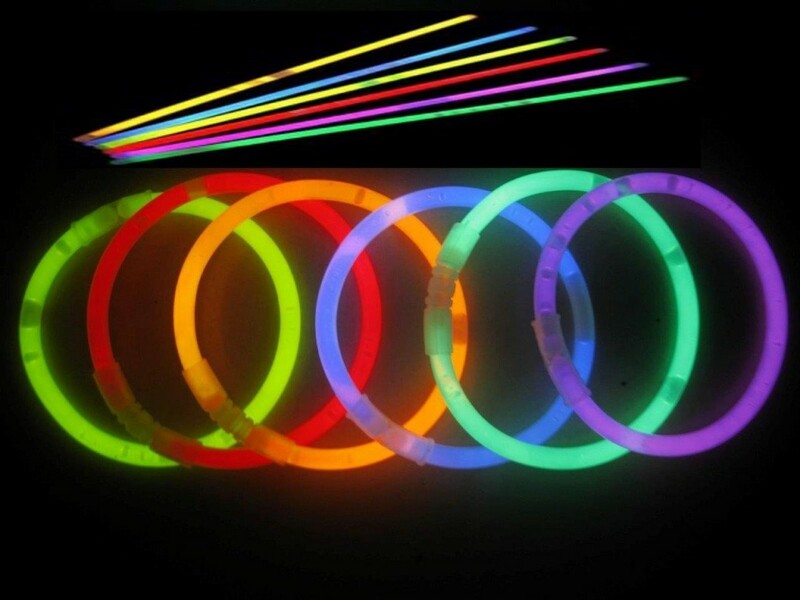 This will help adults enjoy attractions quickly when children are not interested in them. Rider Swap (or Rider Switch or Child Swap) might work for you. Here’s how it works: As you approach the line, let a cast member know you’d like to do a Rider Swap. Everyone (adults and children) will then stand in line together. When it’s your turn, one adult will ride (with an eligible child) and the other adult will stay with the remaining child or children. Then, the other adult will get a turn to ride without having to wait in line all over again. This means the eligible child can ride twice! Toddler princesses are pretty much the cutest thing ever and they deserve to see and do everything princessy possible at the parks. I’ve detailed many options and have included some tips on outfitting your princess, too, in my Disneyland for Princesses post. 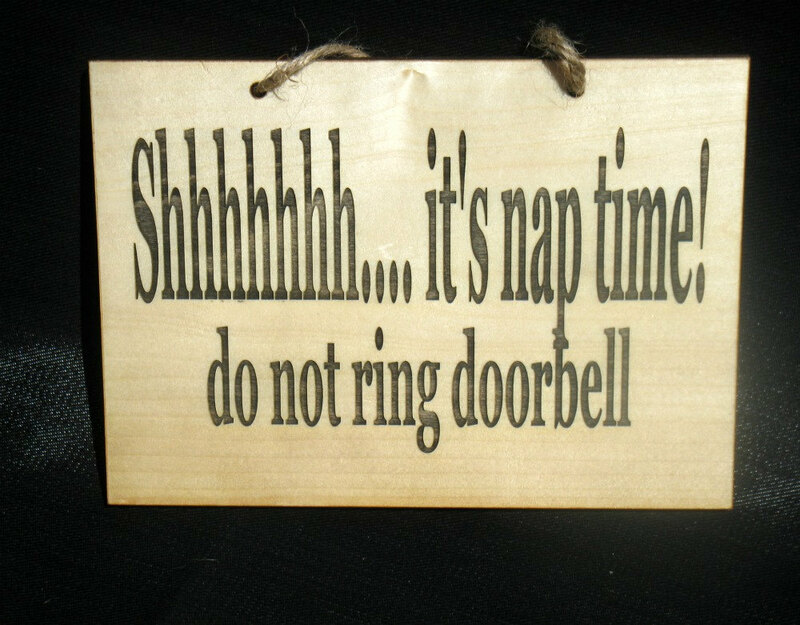 Toddlers need naps and I encourage you to leave mid-day to make that happen. The crowds are heaviest from around 1-5pm, so take a break and spend some time at your hotel. Start your day early and enjoy a less crowded park prior to lunch time. Then, take a break. Let little ones nap, take a shower or have a snack….and return refreshed and ready for an evening of fun. When planning your trip, consider a meal with Disney characters. Toddlers light up during these times and the experience will give you a chance to do several things that you would have had to stand in line for at the park, including taking photos and getting autographs. 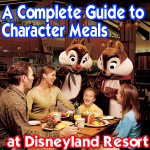 There are five options for character dining within the Disneyland Resort. Each offers something a little different, so review your options to see what best works for your crew. Disneyland has several unexpected scary attractions that you’ll want to know about prior to your visit. Review the ones I think might surprise you. As expected, most bathrooms at Disneyland will have diaper changing stations. 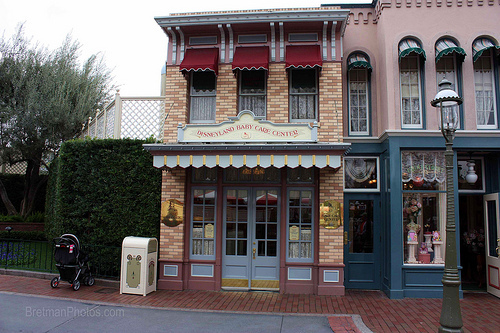 In addition, there are two Baby Care Centers within the parks that have excellent accommodations and supplies for sale in case you run out. The Baby Care Centers go above and beyond providing accommodations to breastfeed, change diapers, warm food in a microwave, feed children in high chairs, or simply sit down for a minute. Prepare yourself and your children by knowing which attractions will be closed for refurbishment during your visit. Most closures are planned well in advance, so you can let toddlers know ahead of time what they might miss out on (or just avoid that area of the park all together). Take a look at which rides will work for your family ahead of time to avoid disappointment. Disneyland has an easy-to-use filter to navigate through the attractions. I’ve got you started by selecting which rides work well for preschoolers. If the parks are super crowded, you have options. Review my suggestions for what to do when Disneyland is crowded. Many of the suggestions I provide are great for toddlers because they require less time in line (or none at all). 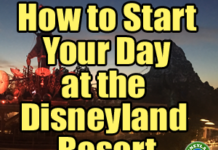 Visit this post for how to start your day at each park. 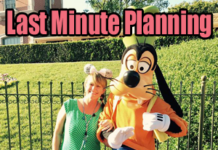 If you follow my tips and plans, you will not wait more than 20 minutes for any attraction in either park (with one exception). This site is amazing! Love all the info. We are first time Disney goers so we really want to get this right. My husband and I are bringing our 3 children in November. Just want to run our itinerary by you to see if you think we have the right parks/activities on the right days. Arriving Sunday afternoon. Staying at a Good Neighbour Hotel – Homewood Suites by Hilton Anaheim Convention Centre. The family suite there seemed to be a good setup and breakfast /light dinners included was a bonus. We want to head over to Downtown Disney for dinner and souvenirs that evening. Get that out of the way before 3 days of parks! Tuesday – day 2 – this is our only day for MM, so we need to do DL this day. Wednesday – day 3 – CA. Do you think 1 day is enough for CA? Our 5yo is “Cars” obsessed! We don’t have hoppper passes. Do you think we should? Or does this itinerary seem ok? We want to do a character dining on of these days (need to book now!) Would you suggest we do Minnie and Friends on Day 2? On the day we have MM? Maybe a later breakfast after a few hours of park that morning? What time do you suggest? Also, we were thinking of doing BBB on day 1 or 2. What day/time do you think is best? So much more research to do, but this site is the absolute best. Thank you so much!!! Later meals are ideal so that you don’t interfere with the early hours when you can enjoy so many attractions. I recommend Minnie’s at 10:30am. That’s perfect for your Disneyland day. I like to do the BBB late morning so that you get as much out of the day all made up, but again, not interfere with the morning hours. Thanks! These agendas are great! I’m stumped on what to do. My husband and I will be taking our 22 month old to the parks in June. Grad nights scheduled on both nights we plan to be in Anaheim. Our flight gets in around 3 pm. I want to maximize time in the parks and am seriously debating getting a 2-day park hopper ticket. Would it be worth it for that half day? Also, there are obviously rides our son can’t go on that we would like to do and there are ones that I’d like to do, but my husband doesn’t. 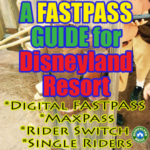 How do I decide between using a Rider Switch and Fast/Max Pass option vs Single Rider? Now that I type it seems like it’d be logical, but I’ll ask anyway. For example on Indiana Jones, that we both want to ride, how do you determine if you’ll use Rider Switch with MaxPass or attempt Single Rider with Rider Switch (possible?)? Or Single Rider vs MaxPass for a ride like Space Mountain, that only I want to ride? Start your second day at California Adventure and use this strategy. Enjoy this park until lunch time and then head over to Disneyland. Cross off everything you aren’t interested in doing and then keep moving through DCA. That strategy will allow you and your husband to enjoy some of the ‘bigger’ attractions. You should be able to get everything done by lunch. Before you go, check out the Disney Junior Dance Party on Hollywood Blvd and Bugs Land for pre-school focused fun. While walking through that list, stop for family friendly attractions like Jungle Cruise, Pirates of the Caribbean, etc. Just look at what’s close by the attractions I listed above. Omit any attractions you were able to get done on day one. Hope I didn’t overwhelm you! Let me know if you have more questions. Casey, this is AMAZING! Thank you! I’ll have to pore over this all and make my plan. Hopefully I don’t have more questions, but will let you know if I do. When it says Lunchbreak in your plans – is this the time you recommend taking the little ones to nap back at hotel? Thank you! Yes. Whatever works for your little ones. It’s all adjustable. Enjoy! We have 4 days at DLR: Monday-Thursday. We have a Magic Morning, so that will have to be either Tues or Thurs. We already have Minnie breakfast reservations at Plaza Inn for the Thurs, so I guess our Magic Morning will be Tues.
One at DCA is enough. I think you’ll do just fine that way. Thank you, Angela. I’ll be updating soon and will make a note of this. So sorry for the confusion. Hi Casey. Love your blog, so many great tips!! We will be back the first week of June and I am so excited. We last visited in 2013 (my first time ever) with my then 4 year old. She will be 8, and tall enough for all the rides, by the time we go in June and we now have a 2 year old. Both are super excited about the trip, but I think mommy is the most excited LOL. We will get a 5 day park hopper. Last time we came, we really took advantage of the fast pass system and rarely stood in any lines. Nap time happened to be during all the parades so we missed those last time. My MIL was with us last time and she wasn’t into rides, so she watched my then 4 year old for all the rides she was too little for. She wont be with us this time, but my aunty will be, but she is also into riding rides. I fully plan on taking advantage of the fast pass system, and I was thinking that my husband and 8 year old can ride while me and aunty watch the baby and then we switch off. We will have fast passes for most rides, but do we need to tell them that we are doing rider swap if we have fast passes or do the fast passes negate the rider swap? Is the world of color show temporary? I dont see it mentioned here, and when looking in advance to see times during the week we will be there, the calendar is not available. World of Color isn’t temporary. Keep checking the calendar for it to be added. I don’t recommend it for every family with young children because it’s not an entirely easy show to see. Everyone stands and crowds into their space to get the best view. I never enjoyed taking my young kids to it. If you want to add it to your day, grab a FASTPASS for it in the morning. If you get a blue pass, arrive an hour early and get the best spot possible on the bridge. If you get a yellow pass, arrive an hour early and move as close as you can to the front of the viewing area. You might get wet on windy days here, so know that before going in. Thank you so much!! I have been reading/studying this site everyday for last several weeks as we have first trip with my 39 month old girl in few weeks!!! I cannot decide whether to plan to buy 3 days or 2 days We arrive on Thurs 12:20 pm and fly out Sunday 8:10 am. By the time we arrive to hotel and checked in, either my girl will be very tired and nap until 5 pm, or won’t nap, which means it will be early bed time. 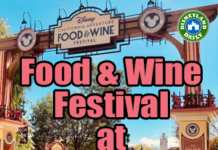 Is there enough things to do/see at downtown Disney district? What do you think? I almost always recommend 3 days over 2, but since nap won’t end until 5pm or so……or with an early bedtime……you might be better off just visiting Downtown Disney and resting up for 2 big days in the park. Well rested kids do much better than exhausted ones. Please let me know if you have any other questions. Hope you have a lovely visit! I just stumbled upon your site in time for our trip to DLR this summer for our daughter’s 5th birthday! We are discussing whether to do both parks or just DL. We will be staying with family in LA and driving down. She LOVES Toy Story and Disney Junior characters which are all at DCA but we can’t have her first visit omit DL! What to do? Is getting a one day park hopper worth it? Or should we plan on a 2 day visit? We could skip DCA but this is the prime time for her to visit. I doubt she will care about Toy Story in 3 to 5 years (the estimated time for another visit). If you can budget it, I would commit two days and explore both parks. There’s SO MUCH to do in each and you’re in the most magical years. Waiting too long would mean you would miss some things. DCA certainly has a lot to see in this realm, but Disneyland does, too. 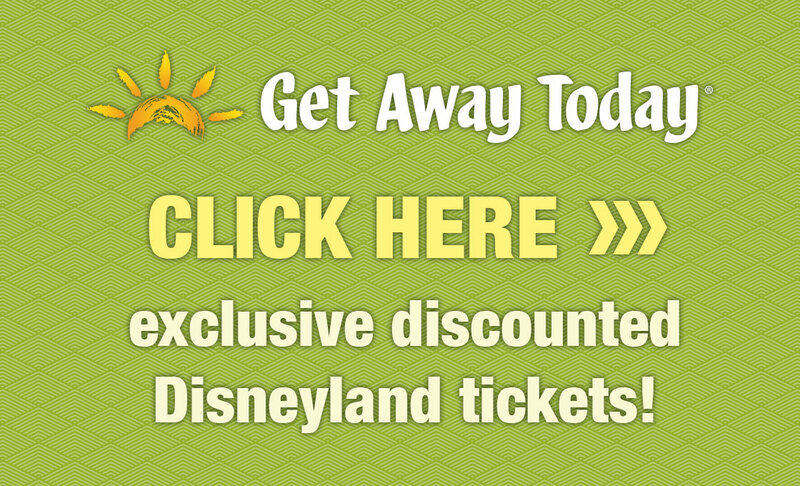 Consider parades and fireworks into your decision……only found at Disneyland. I vote for both! Hope that helps. Thanks for input! Now to convince my husband that we should stay at hotel between days! I was thinking DL the first day to stay late for fireworks then DCA the second day. I have a 5 year old and almost 3 year old. Wanting to take them both to the Anna and Elsa Boutique but my little won’t be 3 yet. Do you think we can get away with taking her even though she’ll be a few months shy of 3? I have a question i will be taking my son for his 2 birthday for the first time. 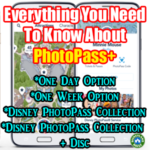 I know we have to purchase an all day pass does that cover for every land we want to visit or is thiere a asditinal fee for each land you vist??? I’m sorry if you’ve answered this elsewhere, but for the rider swap you mentioned the whole family waits in line. Can you bring a stroller into the line? I’m just worried that my 1 yr old would be napping in the stroller and then we can’t do the rider swap because I certainly don’t want to ruin his nap! How would you suggest scheduling a Bibbidi Bobbidi Boutique or Anna/Elsa Boutique visit into one of the touring plans? I think we’re going to try this for my 5 year old daughter. We’ll also have a 2 1/2 year old with us 🙂 Thanks! We are going two park days, day 1 no parks, day 2 DL, day 3 at CA Adventure before we leave Anaheim. So maybe an afternoon appt on the DL day while 2 1/2 year old goes back to the hotel for rest? Then touch up in AM for the CA adventure day? We are taking our 2.5 year old and 11 month old to California Adventure in April, and this has been so helpful, thank you! We’re only able to go for one day, and was wondering if you had any good off-site tips for a chilled change of pace for an hour or so (after the hideous tantrum the toddler will have at having to leave, obviously…) We live in Los Angeles, so we won’t have a hotel room to return to sadly! We’re planning on arriving extremely early, and realistically will be really lucky if both kids last til the afternoon parade, but I would love to stretch them til then if possible. We’re taking our first Disneyland trip in August. We live in FL, and we’re well acquainted with WDW. Disneyland isn’t the focus of our CA trip (unfortunately ;o) so we’re just going to be making a day trip there from Laguna Beach. We have a 4 year old and 7 year old. We’ll be there in early August–hot, I know! We’ll have a double stroller, so the little one will probably fall asleep in that. But, what would you recommend doing for the hot/busy afternoon if the lines and heat become too much for us? Hello, we will be in California for my husbands job and plan to go to Disneyland for only 1 day. I have a 4 year old girl and a 2 year old boy. They are both huge frozen fans so which park would be best to go to for just 1 day? Thanks so much!! Great tips, thank you so much! Just wanted to let you know that when we visited in May 2015, Radiator Springs Racers told us they did not allow anyone to do the ” child swap”. My husband and I had to take turns standing in the single rider line. Thank you! Had not heard this. Good to know. We were there in May 2015 as well and they let us use the rider swap at Radiator Springs Racers. Hi! We live in Los Angeles and are taking my son for his third birthday. Living so close, We know we will eventually do both parks, but are only going to do one for right now. Which park is better for a 37″ 3 year old? He loves Cars, but will we have a better time at Disneyland? Both parks have so much right now. Cars Land is amazing for a child his age, but Season of the Force in Disneyland is a Star Wars dream come true. Really just depends on what he would enjoy most. Season of the Force is temporary, too, with no official end date yet, so keep that in mind. Cars Land will be there for a while and will actually have a new attraction coming soon. Hope this helps with your decision! 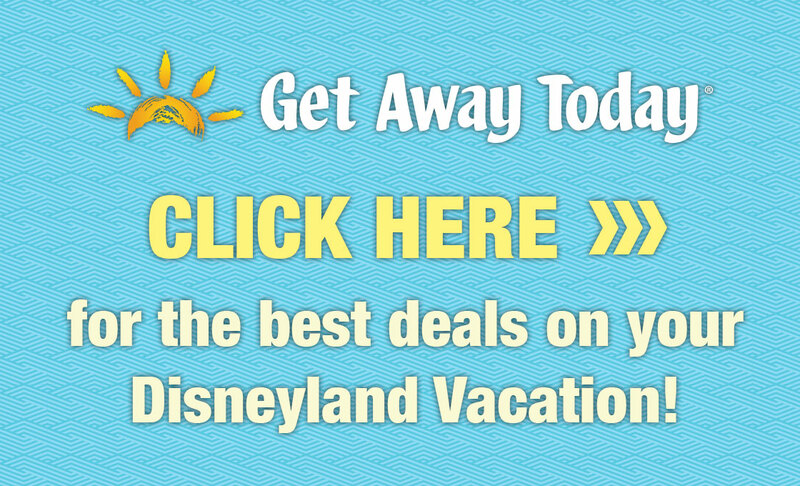 Best website I’ve seen on a trip to Disneyland. For the 2 day little plan, day 1, can you explain why you recommend going to 3 fantasyland attractions, the go to toontown, and then go back to fantasyland? Thank you! Good question. I recommend seeing Mickey Mouse in his house earlier in the day, rather than later. Hence, the leaving of Fantasyland and then back to it after lunch. Peter Pan is a must to do first……then the next two……then go over to Toontown to see Mickey……and then break for lunch. Oh my, this is a lifesaver. We were so worried about disneyland with our two year old, and what rides we could ride. You have made my day!!! I’m so glad, Ashley! Let me know if I can help with anything else. Hi Casey, my husband, 5 year old, and 18 month will be going to Disneyland and C.A in December. My question is what do you think the best stroller is to take? A double stroller, with large cup holders, large carrying basket, try for the kids. A amazing stroller!! Haha. Thank you Casey. I love getting information from your blog. It gets me prepared and excited for our trip. I’m working on adding them. Asap! Great! Thank you. I am excited about using them. I’ve been to Disney tons but this is the first time with my daughter ( or any small child) so I’m trying to plan ahead to make things less stressful. Your site has been a big help! Were these added? I don’t see any .pdf’s. The touring plans above are all in png files which should print like pdfs. Please let me know if you have any trouble with them. Thanks! Thank you so much for this awesome post!! We’re spending 2 days Disneyland and 1 day California Adventure with hopper, will be following your plan. I’ll be grabbing Return tickets for Anna and Elsa meet and greet and FP for Radiator Springs Racers first thing on the California Adventure day. To meet and greet the other Princesses, should I do it first thing on our Disneyland day? is it best to do one day at California adventures and one whole day at Disneyland if you have 2 days for the parks? I recommend spending more time at Disneyland than California Adventure. So, if you park hop, visit California Adventure in the morning and then head back to Disneyland. I think I just spent an hour going page to page reading all your tips on DL. So awesome! I will be back for more, but just wanted to say thank you! We had DL passes a few years ago when we had 4 big kids who were all at least 40″ and could go on almost anything. Now we have a new baby and are planning to get passes again this fall. I’m excited for my older kids (2 are now teens!) but am super stressed about disneyland with a baby. He’ll be between 4 months and 16 months during the time we have our passes and your advice is so valuable! One question: for rides that are for “all ages” like dumbo, snow white, peter pan, winnie the pooh, etc. can you bring a little baby in a front carrier or hold them or have them sitting on your lap? or does a rider have to be able to sit independently? that won’t happen with our baby until later in the year. thanks! Welcome. Happy to help! You can do plenty with a baby at the parks – including enjoying attractions together like Dumbo and Pirates, etc. 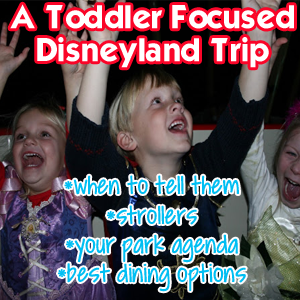 Check out my post for how to take a baby to Disneyland with tips on child care centers and more. Please don’t hesitate to ask me if you have any questions. I was wondering the same thing… specifically about an infant staying in their front carrier while on the ride???? I believe they can since infants are allowed in your lap. Many rides at the parks are slow and family friendly. Thank you so much! Exactly the type of tips I was looking for! 🙂 We are going in September with our 2 year old and 4 year old. I’ve also found when I take my cousins to disney that Tiki Room tends to scare toddlers. Not something thats really expected to scare them but we have had some leave early crying. Good tip, Wilson. Thank you!